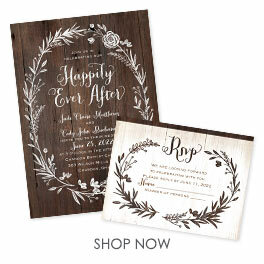 Let friends and family know you've married your Prince Charming and how happy you are they could be there. These fairy-tale thank you postcards feature a heartwarming quotation as a part of your photo. The quotation is printed as shown in your choice of color. Your wording is printed in your choice of colors and fonts. No envelopes needed for thank you postcards, plus you save money on postage! I love how my thank you notes turned out. I opted for a dark red font because by photos was on the lighter side and it looked great. The space is just perfect for 3-4 sentences (I write on the bigger side). I could easily squeeze in more for those I wanted to wrote more on. Also, I'm pretty sure they gave me a few extra postcards which was greatly appreciated!!!! The only way these could be better would be if the postcard stamp "frame" was bigger. I think they got their sizing wrong because my stamp overlapped the box and lessened the decorativeness. Also, I should have ordered these with a gloss finish on the photo side (if that is available?). I wanted it to look more like an actual photo, not a completely matte piece of paper. I guess that's my fault for just picking the cheapest paper.